"I'm standing next to some mountains that are millions of years old," Ernhart said, "and the Earth is itself 4.5 billion years old. How do I even wrap my mind around that length of time?" It's a tough question. A human life is so short compared to the life of the planet. But we decided the perfect place to tackle this problem of perspective was out on a football field. 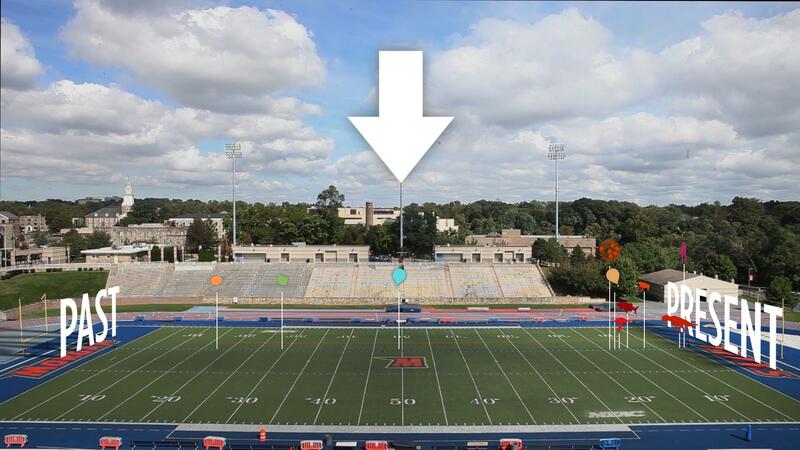 Morgan State University in Baltimore, Md., let us take over its stadium one fall afternoon before practice, and we used the gridiron as a giant timeline. The distance between the end zones – 100 yards – would represent Earth's 4.5 billion-year history. Every inch was 1.3 million years. As we slowly marched down the field, traveling through time, we marked out the places that corresponded to the era when different sorts of creatures arrived on the scene — first simple cells, then fungus, fish, dinosaurs, mammals and, eventually, Homo sapiens. We got the idea for this football field metaphor from Oregon State University professor Eric Kirby. You can listen to him describe the long history of the Rockies while taking a beautiful 360-degree tour of its peaks. Just how close to the end zone do humans appear? Follow the 100-yard journey in our video at the top of this post to find out. Got your own science-y question for us? Use this form to send it our way. We'll be answering questions from NPR's Skunk Bear community every other Tuesday. Many people will spend this holiday weekend watching football and maybe even playing a pickup game or two. Even people who have no interest in football should visit a field. So says science reporter Adam Cole, who runs NPR's YouTube channel Skunk Bear. He says a football field is the perfect spot to contemplate humanity's place in history. ADAM COLE, BYLINE: Last week, Skunk Bear got a question from listener Grant Ernhart. He recorded it up in the Canadian Rockies. GRANT ERNHART: I'm standing next to some mountains that are millions of years old, and the Earth is itself 4 and a half billion years old. How do I even wrap my mind around that length of time? COLE: That's a tough one. Humans only live 100 years or so, and we've only been around as a species for a few hundred thousand. The only way I could get my head around that 4.5 billion years was to visit a football field. COLE: Here I am standing at one end zone. Let's say this is the moment in time when the Earth formed. And way down at the other end of the field, that's the present. I'm going to walk the 100 yards in between, time traveling through the whole of Earth's history. This first 10 yards - that's the first half billion years - is pretty dangerous. Our baby planet is being pummeled by space rocks. But by the time I reach the 15 or 16-yard line, things are more peaceful. And this is where scientists think life began. UNIDENTIFIED MAN: First life, 3.8 billion years ago. COLE: It's just simple life, single cells floating in a vast ocean. And there won't be much to see for a while, so I'm going to jog the next couple billion years. New kinds of cells are showing up all the time, and some of them are figuring out how to get energy from the sun. OK, I've made it to the 50-yard line, halfway through Earth's history. UNIDENTIFIED MAN: 2.3 billion years ago. COLE: Luckily, there's now enough oxygen in the air to let me catch my breath. But there's still no humans in sight. There's not even a single animal. So on we go past the 40, the 30, the 20. UNIDENTIFIED MAN: Thirteen-yard line, 600 million years ago. COLE: Now things are really starting to pop up - fungus, anemones, mollusks. Animals are crawling on the land and in the sea. Fish give us a huge innovation - bones. COLE: I'm passing the 10-yard line now, and there are sharks, amphibians, dinosaurs, flowers. And there up by the one-yard line is the Tyrannosaurus Rex. I've run almost the entire length of the field, billions of years, and I just got to a creature we humans think of as prehistoric. UNIDENTIFIED MAN: Mass extinction 66 million years ago. COLE: Our friend the T-Rex is gone, killed off along with three-quarters of all life on Earth. Who done it? Either an asteroid, a bunch of volcanoes, climate change or some combination of all three. COLE: Now I'm just a few steps from the end zone and still no humans. But the age of mammals has arrived - camels, whales, the ancestors of dogs and cats, giraffes and hippos all packed into this last yard. And where are the humans? I'm taking a knee now, looking down at a few blades of grass an eighth of an inch from the end zone. Here, finally, we have the first humans that look like us. COLE: And right here, just before the goal line, in a space twice the width of a human hair, is all of human civilization - our cities, our literature, our music and, of course, the game of football. COLE: Adam Cole, NPR News. MCEVERS: And you can watch Adam make this hundred-yard journey through time at youtube.com/skunkbear and at npr.org. Transcript provided by NPR, Copyright NPR.